Talk on Ancient Italian/Roman DNA over in Stanford. Thread: Talk on Ancient Italian/Roman DNA over in Stanford. Hannah Moots is a PhD Candidate in the Stanford Archaeology Center and the Department of Anthropology at Stanford University. Her research draws on bioarchaeological, paleoenvironmental and genomic lines of evidence to investigate connections between environmental change and human health. Her work examines the recursive relationship biological and cultural changes - such as pathogen burden, mobility patterns, and dietary shifts that came about in the Neolithic transition. She holds an MPhil in Archaeological Science from the University of Cambridge and her past research includes an archaeogenetic analysis of the dispersal of several domesticated crops, including taro (Colocasia esculenta) and broomcorn millet (Panicum miliaceum), and a paleoenvironmental reconstruction of the aridification of the Saharan Desert over the last 5,000 years at Gobero. I hope they won't just broadcast but also publish the study. I would expect Isola Sacra to have genomes from all over the mediterranean. DNA from the Ostia crypt should be a good representative of Roman/Iron Age Central Italian DNA. In a 1000 years would studying ancient DNA from the New York City of 2018 provide a good lens to make inferences about the American population as a whole? Color me a bit skeptical, but we'll see when the paper comes out. I don't know what Reich and Paabo are waiting for. Indeed. That's why I said we'd have to wait and see. I certainly hope she's a competent computational geneticist and not just an anthropologist, and that Spencer Wells isn't involved. Everything he's done recently has been sub-par imo. The fact that the samples come from port cities directly linked to the Roman metropolis also suggests to me that the results of this study should be read carefully. It'll probably indicate the degree of long-distance international travel and how much direct contact Central Italy had with the rest of the Empire and even beyond it, but I don't think it will be a good representation of what most of the population was like, especially as at least ~70% of them lived in rural areas even in such a highly urbanized area. Yes, that's my concern. Something like 13% of the total New York City population is Jewish, but only 1.4% of the U.S. population. You go to Queens, and it could be 25% and up for the Jewish population. This applies to Asians as well. Go up the Hudson to upstate New York or west into Pennsylvania, and it's an entirely different genetic group. These are the kinds of skews which are common. It may be interesting to know the make-up of the port cities of the Italian peninsula and of Rome itself, just as it was interesting to learn about the SSA people in Britain, or the Romans in Britain, for that matter, but it doesn't tell us how much of their genetic material had an important impact on the genomes of even modern day Lazio, much less the Veneto, as just one example. Hopefully, she also has contemporaneous genomes from places like the Veneto, Emilia Romagna, Toscana as well. I'd like to see genomes from sites in the south which were settled by the Greeks as well, and a comparison with ancient samples from Greece. We're getting sample DNA from at least Rome. And Rome for much of its history in the republic to empire from all evidence was overall homogeneous (that is, the foreigners were largely slaves who didn't have many children). What's so odd about that? The Romans more or less started Western Civilization. Not sure what I need more, sleep or this study! I don't really expect any surprises, but it would be interesting to see when J2 arrived (I'm guessing 3rd millennium BCE with an expansion of warlike elites from West Asia; I think the spread of J2 during this period and the previous millennium is related to the spread of the Anatolian and Gutian branches of IE (so I actually think Minoan, Etruscan etc. are IE, and that Kura-Araxian J2 should be seen as equally IE as R1b and R1a)), and whether there was some very early R1b-L51 in the South (Gaudo culture etc.) as I'd guess that to be the case. Z2103 and J2 (obviously only specific branches of J2a and J2b, as J2 is old) have such a magnificent modern-day correlation that I'm puzzled at the lack of J2 in Yamnaya. I am fully convinced that R1b-M269 was in the Middle East at least as early as the 8.2 ky event, and I am also fully convinced in a Paleolithic diversification of R1 in the Zarzian culture (which has clear links to the Epigravettian). Everything between that, I'm still trying to work out. At the moment, I'm thinking R1b-P297 expanded at the very beginning of the Holocene from the Zagros to the Volga-Urals via the Caspian region, and that R1b-M269 moved back down to somewhere in the Northern Middle East perhaps as a result of the 8.2 ky event, but I'm changing my mind a lot. I definitely think R1b-M269 diversified around the Northern Middle East, though, just not sure whether early R1b-M269 originated there or not. Last edited by ToBeOrNotToBe; 07-02-19 at 02:38. They have their own agendas. For their own reasons, personal in one case, Nordicist based on the other, they are desperate to prove that Italians are not "European", or at least not European in the sense of lots of descent from the holy Indo-Europeans. Years ago, on forumbiodiversity Mr. Davidski, or I think it was Polako on that site, opined that all Southern Italians should be kicked out of Europe because they were mongrels. Sikeliot wants them to be Levantine. It's completely bizarre, but there you have it. For some reason we attract this kind of garbage. Maybe we disrupt their ideology in some way. Who knows. It's just a shame that it should intrude on what should be intellectual and objective discussions. I do hope we get the data from this paper, and the paper from Reich/Paabo as well. I've been saying for years that all I have is questions. It's time for some answers. Yeah, it is rather amusing - Sikeliot loves West Asians, Davidski hates them, and their opposites seem to converge on Italy and Greece. Don't believe Sikeliot's current stories. For years he was Portuguese Princess and lots of other "Iberian" socks on theapricity, bashing the Southern Italians for having more inferior "Near Eastern" ancestry than the Portuguese (and by implication the Spanish) of his mother's people. All you have to know is that he hates his Sicilian father. Unfortunately, I've been around a long time, so I know where all the skeletons are buried. Their recent PC talk doesn't cut it with me. 134 genomes, spanning 12000s BP to Renaissance and enlightenment. 0.5-3.5X coverage. Vast majority of sampling sites concentrated in Rome and surrounds, lowlands of Latium around the Tiber River, up to Ostia, almost all restricted to Lazio. Some extend to Abruzzo, South Le Marche, none, or maybe one, in Tuscany, and on the South of Tuscany if that. Couple of samples from Sardinia. I'll give a PCA position and a ADMIXTURE description for each time period. Note that the ADMIXTURE only had Iranian, EEF, WHG, EHG and Levant_N, no CHG. Where Iran N appears, it may be a stand-in for CHG. There is something quite puzzling in the list below, mislabeling in the slides? But that doesn't explain it either. Do the different cluster centroids (N, S, S, N again) represent migratory fluxes within Italy and also from outside? More sampling is needed, much more, populations much more inhomogeneous than in other archaeogenetic studies. It would be good if he actually managed to get dates to the nearest 500 years rather than just "Neolithic". I'm going to assume the Iran_N ancestry in the Neolithic he's referring to is actually Chalcolithic. And his point about an increase of WHG and EEF in the early Bronze Age (i.e. Beaker expansional period) is interesting. EDIT: Actually from his phrasing, it seems Italian Neolithic was Iran_N from the beginning? THAT would be amazing and totally unexpected, surely that isn't the case right? Out of disbelief, I'm still going to assume that this increase in Iran_N is actually from the Chalcolithic. Presumably, the Rinaldone culture (4th millennium BCE onwards). Iran_N in pre-copper age Italy would be mindblowing. The Imperial period results suggest that lots of the Middle Eastern ancestry in Southern Italians actually comes from migrants from the Roman Empire? The part about Syrians and Iraqi Jews is clearly a reference to the idea that Middle Eastern immigration caused part of this shift (and I suppose the presence of Y DNA e.g. R1a and Q1b in Sicily is a huge giveaway to this idea, as that can only have come from the 2nd millennium BCE at the very earliest (it only arrived in West Asia with the Indo-Iranians). LOL, somehow this actually seems to play into BOTH Davidski and Sikeliot's fantasies. 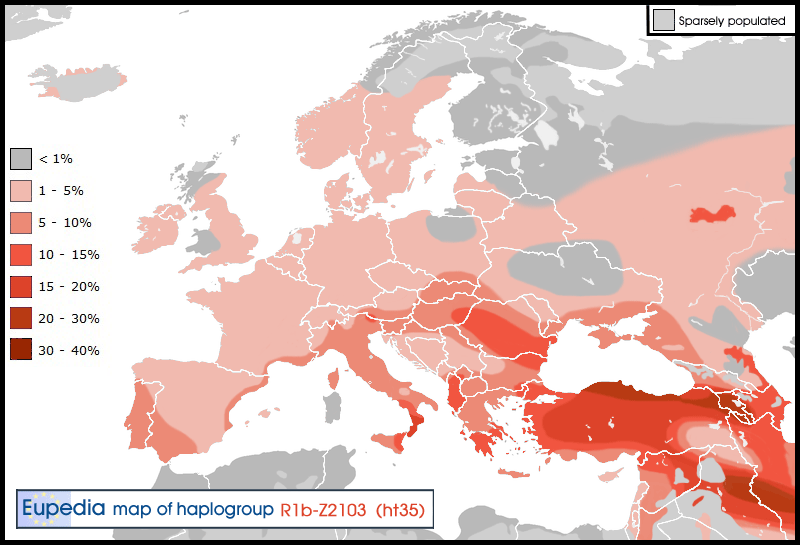 How was there not an increase in Steppe ancestry (EHG as a tracer for this) in the Early Bronze Age? From what he said, it seems like this ancestry only arrived in the Iron Age - what?! It would be great to know if this Bronze Age increase in WHG and EEF was more pronounced in terms of WHG or in terms of EEF. The Beaker groups in Central Europe were very WHG rich (compared to, say, the more obvious Steppe groups like CWC), so perhaps this is from a theoretical pre-Steppe admixed Bell Beaker group. The other alternative is that Iran_N was an elite element in the Chalcolithic, and that during the Early Bronze Age this had been diluted with the EEF natives. Still, I would have expected some EHG if this is Bronze Age. Perhaps the arrival of U152 Beaker folk was initially limited to Northern Italy? My guess is that the Italic languages were spoken by G2, I2, Es, Ts perhaps some Js and others. That's just stupid and you know it. The Italic languages don't date back to the early Italian Neolithic, they either came in the Early Bronze Age with the arrival of U152 Bell Beakers, or (very unlikely) later in the Bronze Age. "Isotope information not available yet, no way apart from archaeological context to tell between migrants and locals." So, I would suggest waiting for the paper and the results by sample, and with the isotope information, i.e. which were migrants and which locals. Also keep in mind that these are all samples from Lazio. No Sicilian or Southern Italian or Northern Italian or Tuscan samples. As for Iran Neo in the Italian Neolithic, let's see, who was it who came on here to tell me that I was insane to think that Iran Neo might have arrived in Italy not only before "all the slaves" during the days of the Empire, but perhaps all the way back to the Neolithic? I kept on saying this component had been in Italy at least since the late Neolithic, perhaps bordering on the Chalcolithic, as Otzi showed, as I must have said a hundred times. Maybe it's even a bit earlier. After all, it would have had to make its way all the way up the boot to the Alps. Let's see, could it have been Polako, and Sikeliot, and Azzurro who were so incredulous? Are you lurking, guys, ready to downvote? I can see them, you know. I'd been saying this since the days I was active on the defunct DNA Forums, and on the forum at 23andme. Epic arguments I've had with all of them over the years. Well, now we know. And well, well, Early Bronze Age central Italians are still a lot like Sardinians. It will be interesting to see the dates. Is this after the arrival of populations from central Europe? If it's before, was there culture transfer without gene transfer? So when did the Central Europeans actually arrive? "Fewer samples, of those that exist 60% overlap with North Italy, 40% overlap with South Italy and Sicily, centroid of overall cluster in central Italy but no samples occur there, very wide spread. EHG appears, Levant N Appears for the first time, sporadic and inhomogeneous distribution, Iran_N increases further." As for the EHG coming in, and the Levant, let's see which samples have it and how much. I completely understand the continued increase in Iran Neo. All of the southern regions, with their inhabitants of Greek descent, were being incorporated into the Republic. That's what all those wars were about for the few who actually know some Roman history. Iran_N increases further, Levant N again sporadic and inhomogeneous." Well, if a lot of the samples are from port cities this is not surprising. (Frankly, I don't see the point in their releasing this kind of data without delineating between migrants, who could have been temporary, or slaves, and locals). As I said, we'll see how many of the samples are "locals", and whether they're all from urban settings. The latter is very important. I'd want to see the yDna as well. There were a lot of Jews in Rome. I must say, though, I thought the whole Levant was supposed to have emptied and come to Italy. That's what Sikeliot told me, anyway. Only SPORADIC and inhomogeneous Levant Neo? What a letdown for him. What we're seeing, instead, is early and continuing Iran Neo. For the future, I think it's going to be very important to see the local Southern Italian samples. Did they, as a result of Greek colonization, contain enough Iran Neo to account for the increase further up the peninsula on their own, or was there some incorporation of outsiders? Tight cluster centroid in S Italy, in the same place as in the previous period. Southern tail to Middle East disappears. N Italian, Northern European and NW European outliers exist." Good grief, how can this be? I thought all of North Africa arrived in Sicily and Southern Italy. How can they be basically the same as they were in Late Antiquity? Even if they're including the 8th century in their definition of Late Antiquity, the samples of that period are still basically the same as those from the Imperial period. So, no room for a huge effect by the Moors. I always figured somewhere under 10% maximum.